Like most Area Groups, the FCAG likes to have a small layout on the go, to give us something to exhibit at local shows and to give us a focus to develop our building skills. Sauchenford is the Group's current layout. Started in 2011, it has cassette-based fiddle yards at each end of a short scenic section representing a colliery junction on the Caledonian main line in central Scotland between Larbert and Stirling. 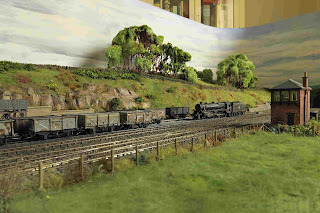 Sauchenford is a real place (sauch is a Scots word for willow), but the layout is imaginary, although it draws inspiration from locations like Plean and Polmaise. Sauchenford, with Alisdair Campbell's Black 5, built from the 2mmSA etched kit. At the Aberdeen show in late 2015. Jim Watt built the Caledonian flap ground signals from his own etches: the diamond crossing and bridges are his too. 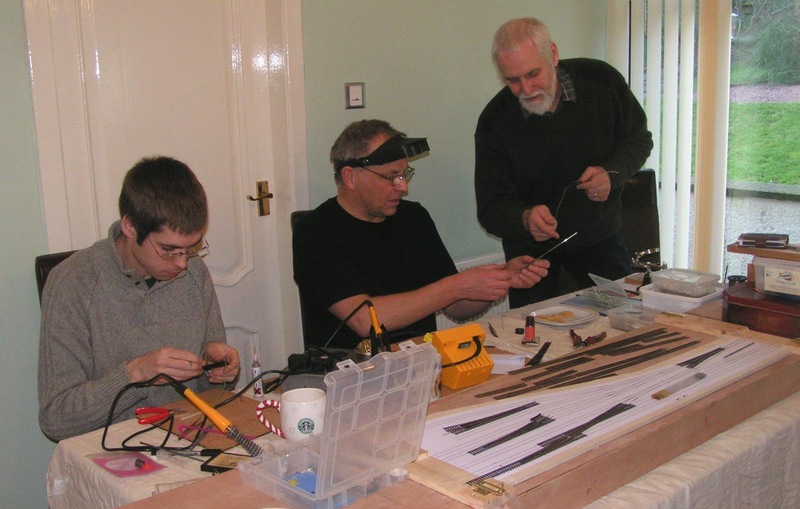 Alisdair built the typical Caley Northern Division signalbox and developed the scenery which is complemented by Alistair Mearns' backscene. The exotic visitor on the right is a Caley 439 class 0-4-4T built by Ian Noble from Worsley Works etches . A short section of main line between two bridges is modelled, with a signalbox controlling trailing connections to a small reception yard with a branch to an off-scene colliery. The idea is that main-line passenger trains can roll past while trains of empties arrive in the reception road, are tripped to the colliery, then returned full for assembly in the departure road. The whole thing is based on five short modules which stack to facilitate storage and transport. Sauchenford under construction during a session hosted by the late Colin Brady, a stalwart of the group for many years. 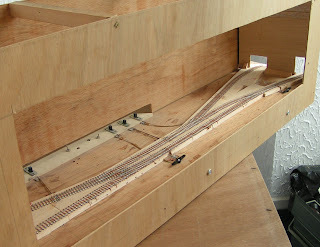 Easitrack and points with individual plastic timbers are used on a thin balsa track base. Both the plastic timbers and the balsa were subsequently regretted: the glued chairs didn't allow for fine adjustment and a few copperclad sleepers at strategic places are necessary. The balsa base does not resist inadvertent pressure well enough to be a truly stable base and we had problems with invisible dips in the track causing uncertain pickup. 1mm plywood might have been a better choice. Until 2010, we exhibited Gartcraig, a small freelance urban layout started in the late 1990s. Here it is at the 2009 2mmSA Expo at Keighley with the late Colin Brady's finescaled Minitrix class 27 with one of Jim Watt's resin-cast Caledonian wagons. Gartcraig - now retired, but still in existence. as it was easy to keep something moving. on a scratchbuilt compensated chassis - shunting at Gartcraig. Before Gartcraig there was a bit of a hiatus during the 1980s. Balbeggie, a continuous run with a fiddle yard on one side and a single-line passing loop station on a fictional Caledonian/North British/Highland joint line, was started in 1977. It got the length of baseboards and bare track, but never saw the light of day at an exhibition, as Group members moved away and new members had different interests. It was chronicled in the 2mmSA magazine between 1979 and 1981. Abercraig was the Group's first exhibition layout, built in 1974 with a two-baseboard station-and-sector-plate design, 3' and 2'6" long respectively. This was found too restrictive, so in 1975 it was expanded to an L-shaped design by adding a goods yard and turning the sector plate into a traverser. Magazine articles followed its progress in 1974 and 1976. The extended version was exhibited at the 1976 Glasgow show.